The Southern Ocean waters to the west of the Antarctic Peninsula are warming faster than almost any other place on Earth. This area of most rapid environmental change was, among others, targeted by the Census of Antarctic Marine Life (CAML) in its collection of biogeographic information. Such biogeographic information is of fundamental importance for monitoring biodiversity, discovering biodiversity hotspots, defining ecoregions and detecting the impacts of environmental changes. It is the preliminary and necessary step in designing marine protected areas in a changing ocean. At the end of five years of extensive biodiversity exploration and assessment by CAML and the OBIS Antarctic Node (the SCAR Marine Biodiversity Information Network, SCAR-MarBIN), a new initiative, the multi-authored "Biogeographic Atlas of the Southern Ocean", has been established. Under the aegis of the Scientific Committee on Antarctic Research (SCAR), the aim of the Atlas is to provide an up-to-date synthesis of Antarctic and sub-Antarctic biogeographic knowledge and to make available a new comprehensive online resource for visualization, analysis and modeling of species distribution. It will constitute a major scientific output of CAML and SCAR-MarBIN, as well as being a significant legacy of CoML and the International Polar Year to fulfill the needs of biogeographic information for science, conservation, monitoring and sustainable management of the changing Southern Ocean. It will be of direct benefit to the Antarctic Treaty and associated bodies such as the Convention for the Conservation of Antarctic Marine Living Resources. Census of Antarctic Marine Life (CAML) and the OBIS Antarctic Node (the SCAR Marine Biodiversity Information Network, SCAR-MarBIN). 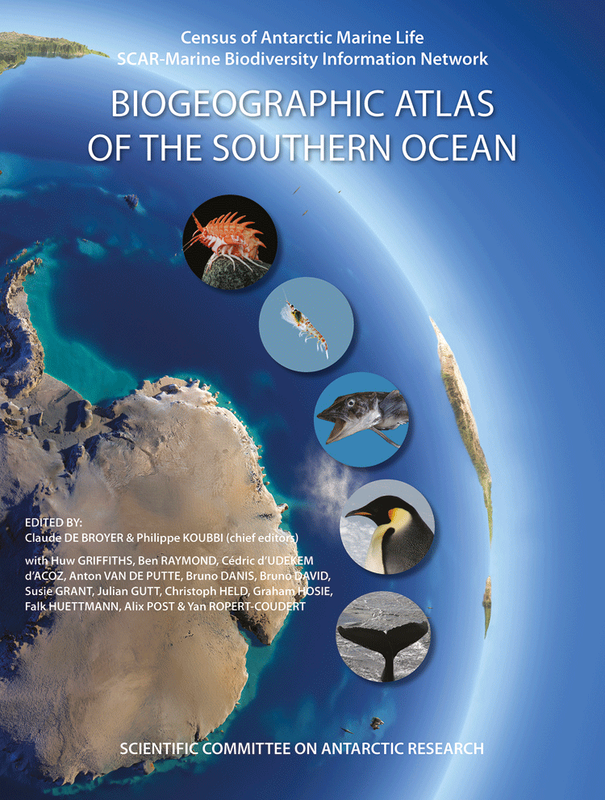 Currently the Biogeographic Atlas of the Southern Ocean is only available as a published book. In the future, dynamic editions of the Atlas will be developed, including a dedicated web portal and an e-book, connected to a world network of interoperable databases, and offering advanced functionalities for access to original occurrence and environmental data, customized mapping, data visualization and analysis. This will contribute to the ecoregionalization process and the modelling of predictive distribution of species and assemblages in the context of environmental changes.